Tucked into the Entrada at Snow Canyon golf resort community in St. George, Utah in Washington County is the exclusive gated neighborhood of The Reserve. Each of the neighborhoods within the Entrada golf course community has a distinct characteristic, a theme woven into the design that ties the neighborhood together. In the case of The Reserve, privacy and serenity are the elements of desire. The custom homes in The Reserve are situated on large lots enveloped by ancient lava rock in an enchanting desert atmosphere. The Reserve at Entrada at Snow Canyon is an exclusive gated community with unsurpassed views of Snow Canyon, the red rock mountains. Some of the homes closest to the red rocks back right up to lava rock walls for the ultimate experience in privacy. Homeowners in these custom lots, many of which extend more than two and a half acres, need never worry about neighbors moving in behind them. In fact, the entire community is designed with ample elbow room between neighbors, enhancing the elements of privacy and serenity that make the community so appealing. When you’re at home within the confines of the community’s gates, it’s easy to feel separate from rest of the world. Because the master-planned Entrada at Snow Canyon golf resort community believes in honoring, respecting, preserving, and showcasing the beauty of the area, and because there are rules enforcing respect for the native landscape, residents living in The Reserve have unobstructed views without the risk of modern construction destroying the scenic surroundings. You can sit outside in your gorgeous backyard laying on a lounge chair by the pool soaking in starlight as if it shone just for you. The custom homes in The Reserve at Entrada at Snow Canyon leave no stone unturned concerning comfort and luxury, and the maintenance-free lifestyle allows more time for enjoying life’s pleasures. From exquisite architectural design to skillful construction with top-notch building materials, these homes sprang forth from the imagination of luxury in one of the most beautiful areas the country has to offer. Sit inside the comforts of your custom home, enjoy the yard where you can soak in golden rays of the sun or milky moonlight at your desire, but then realize that your home is tucked inside one of the might highly respected private golf course resort communities in the United States: Entrada at Snow Canyon. 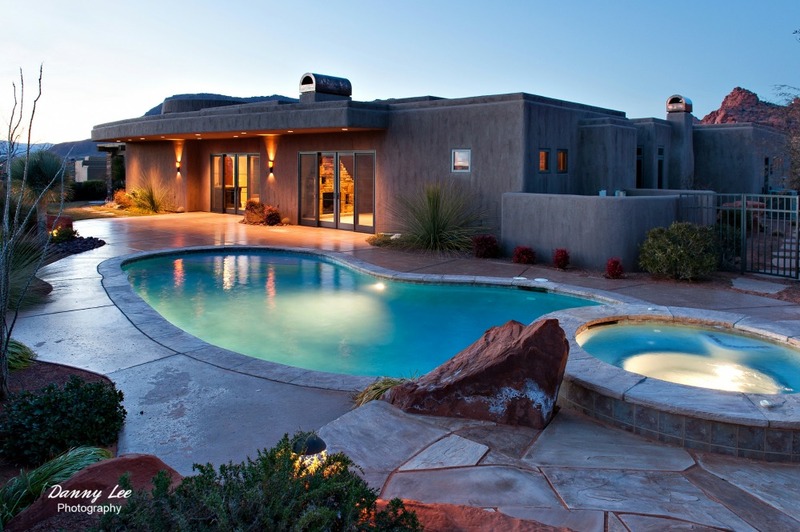 Entrada at Snow Canyon is a master-planned golf course community featuring the Entrada Golf Course and Country Club. The award-winning golf-course is unlike any other as its set amidst the sandstone cliffs, red rocks, lava walls, and desert sage. The clubhouse features a swimming pool, fitness center, ballroom, locker rooms, dining facilities, and more. Of course, the entire structure of life at Entrada at Snow Canyon, including residents of The Reserve, is constructed around social activities and networking. There’s a full calendar of community events as well as coordinated events with like-minded residents to enjoy outings together. You can opt for the quiet, secluded, serene comforts of your luxury home, or you can get out and about to meet and greet with the neighbors. Either way, you’ll be glad you chose life at The Reserve at Entrada at Snow Canyon.